The first presidential election reported in the columns of the Vineyard Gazette was that of 1848, two years after the founding of the Gazette by Edgar Marchant. The election took place on Tuesday. On Friday the Gazette printed the result in Dukes County, which was as follows, the figures being those for Taylor, Cass and Van Buren in that order: Edgartown 157, 46, 35; Tisbury 99, 38, 42; Chilmark 34, 49, 4; total 290, 133, 81. Dukes County therefore went Whig by a majority of 76. Besides the fact that there were only three towns in the county, it is also striking that Edgartown was the dominant voice. General Zachary Taylor was, of course, elected, but the Vineyard did not know that until later. The Gazette was not able to announce the winner until the following Friday when more complete returns had been received. Result in the Union, Massachusetts, Vermont, Kentucky and Tennessee have gone for Scott. California is not heard from. All the other states have voted Pierce. In 1856 Edgartown gave Fremont, Republican, 197, Buchanan, Democrat, 65, Fillmore, American, 8, Tisbury gave Fremont 85, Buchanan, 51, and Fillmore 109, and Chilmark gave Fremont 35, Buchanan 45 and Fillmore 5. The marked split in political taste between Edgartown and Tisbury is worthy of comment in these days when the Island shows a solid Republican front. Lincoln, Republican, won a large majority of Vineyard votes in the election of 1860, polling, with Hamlin, 171 in Edgartown, 113 in Tisbury, and 55 in Chilmark. Douglas and Johnson, Democrats, ran second in all three towns, 42 in Edgartown, 52 in Tisbury and 22 in Chilmark, while Bell and Everett, Unionists, polled 27 in Edgartown, 30 in Tisbury and 1 in Chilmark. Election notes stated “Democrats give up almost everything in New York State. The New York Herald announces that Lincoln is elected President of the United States.” The fair vied with the election in order of importance and fair awards rated two columns to the election’s one. “Abraham Lincoln and Andrew Johnson elected” triumphs the Gazette in 1864, adding, “New England has thrown an overwhelming vote for Abraham Lincoln, and the returns from the other states show a large majority against an armistice with the rebellion, and for a strong support of administration.” Lincoln and Johnson’s votes are listed first, M’Clellan and Pendleton’s following: Edgartown, 232, 52; Tisbury, 195, 50; Chilmark, 42, 35. The voters gave Grant and Colfax, 188 in Edgartown, 186 in Tisbury and 44 in Chilmark. Seymour and Blair polled 38 in Edgartown, 28 in Tisbury and 42 in Chilmark. With the return of Edgar Marchant, the “old editor,” to the helm of the Gazette, and the continued victory of the Republicans, election news dwindled again in importance to that dauntless Democrat. He conceded the reelection of Grant in 1872 without enthusiasm, adding “Now ‘Let Us Have Peace.’” The Island voters gave Grant and Wilson 249 in Edgartown, 226 in Tisbury, 51 in Chilmark and 14 in Gosnold, that town’s first appearance in the electoral lists. Greeley and Brown got 40 votes in Edgartown, 52 in Tisbury, 24 in Chilmark, and none in Gosnold. No returns were received from Gay Head, incorporated since the last election, since the clerk inadvertently left the record of the vote at home when the clerks of the several towns met to record the vote. “Blow Ye the Trympet,” cried Edgar Marchant. “The Eagle Soars Over a Land Redeemed from Corruption and Misrule. Grantism Defunct. Samuel J. Tilden elected President. A Reign of Beneficence, Equality and Justice Assured.” The columns of the Gazette were adorned with American eagles and the Stars and Stripes. “The election in Dukes County passed off very quietly in all the towns,” was the Gazette’s verdict in 1880, the result being as follows: Garfield, 201 in Edgartown, 199 in Tisbury, 70 in Chilmark, 87 in Cottage City (offspring of Edgartown after a bitter conflict), 18 in Gay Head, 20 in Gosnold; Hancock, 52 in Edgartown, 51 in Tisbury, 40 in Chilmark, 31 in Cottage City; Dow, 1 in Edgartown, 1 in Cottage City. Chilmark’s was the largest vote and the largest Republican majority ever cast in that town. It is noteworthy that in all the early elections recorded in the Gazette, Chilmark displays the greatest catholicity of taste in voting as compared with Edgartown and Vineyard Haven which voted consistently for the Republicans or their fore-runners. The story goes that Chilmark had been known for years as a Democratic town, but that when the price of woold - the most lively interest to that sheep-raising town - fell to new lows on one occasion, the blame was laid on the Democrats and Chilmark swore allegiance to the rival party. A quiet election was again recorded in 1884, with a full vote, 818, against 771 in 1880. Four candidates were Blaine, Cleveland, St. John and Butler. Edgartown gave them 184, 55, 5 and 1; Tisbury, 213, 56, 31 and 5; Chilmark, 62, 36, 2 and 0; Cottage City, 73, 46, 25, 0; Gay Head cast only 24 votes, all for Blaine; Gosnold’s vote was not recorded. County conflict over the representative contest and allusions to “the gentleman of New Bedford who with all his wealth and position and individual and corporate influence finds the little district of Dukes is too big for him to successfully handle” drew more fire from the Gazette than Cleveland’s victory. The election of 1888 was the first to show the name of Charles H. Marchant at the masthead of the Gazette recording the election. Harrison polled 211 votes in Edgartown, 188 in Tisbury, 108 in Cottage City, 40 in Chilmark, 10 in Gay Head. Cleveland’s vote was 56, 64, 39, 26, 7, and Fish’s 1, 69, 24, 20 and 4. Gosnold’s vote was not reported. Election news was received by phone at Holley’s grocery in Edgartown until 2 a.m. Archibald Mellen, Sr., 92, who had cast his ballot for Gen. William Henry Harrison for president in 1840, was the first to vote in Edgartown, casting his vote for Benjamin Harrison. Capt. Jared Jernegan, whaleman, cast his first vote, though well beyond 60 years of age, this being the first presidential year that had found him at home since he became a voter. The vote: Harrison, Edgartown 195, Cottage City 118, Tisbury 131, West Tisbury (in the picture for the first time) 70, Chilmark 40, Gay Head 15; Cleveland, 58, 42, 65, 29, 33, 2; Bidwell, 6, 10, 13, 23, 8. “The election in Dukes County passed off with the usual good order, the principal contest being on the selection of a Representative (Capt. Otis Foss). The vote: Edgartown, McKinley 221, Bryan 21, Palmer 8; Cottage City, 119, 34, 5; Tisbury, 188, 19, 5; West Tisbury 85, 5, 13; Chilmark 42, 11, 2; Gay Head 19, -; Gosnold 17. “309 to 139. McKinley and Prosperity. Republicans Sweep the Country. The Administration Enthusiastically Endorsed by the American People,” announced the Gazette in 1900. The landslide of 1896 is beaten by the avalanche of 1900...The election returns as received on Tuesday night on the Vineyard were the most satisfactory as regards promptness and completeness of any national election returns ever received on the Island. The Southern Massachusetts Telephone Co. had a special operator and assistant on duty at New Bedford, and from that city direct connection was made with New York and other points...Tuesday, as four years ago, was a golden day in autumn - McKinley, 195, Bryan, 19, Woolley, 3; Cottage City, 104, 40, 7; Tisbury, 157, 24, -; West Tisbury 90, 17, 9, Chilmark 32, 11, -; Gay Head, 20 -; Gosnold, 19, 3, -. Gay Head was the banner town in the county and possibly in the state, in 1904, casting 35 Republican votes and no Democratic votes, In what the Gazette called the greatest landslide in political history throughout the country, the Vineyard voted as follows: Edgartown, Roosevelt, 188, Parker 33; Cottage City, 117, 25; Tisbury, 149, 25; West Tisbury 70, 18; Chilmark, 31, 11; Gay Head 35, 0; Gosnold, 13, 2. About 750 voters went to the polls. Only about 730 of the Vineyard’s 1000 registered voters turned out at the election of 1908. Interest slackened early in the evening when it became evident that Taft had won over Bryan by a large majority throughout the country. The vote: Edgartown, Taft 154, Bryan 25; Oak Bluffs, 114, 27; Tisbury, 154, 35; West Tisbury, 63, 21; Chilmark, 46, 21; Gay Head, 31, 2; Gosnold, 25. 3. It fell to the Gazette in 1912 to record with as much tolerance as it could muster Wilson’s election by the greatest sweep since that of Grant over Greeley in 1872, with “Republican Victory Here and There the Sole Comfort of the Old Guard.” The three candidates were quite evenly matched on the Vineyard, where the vote was: Edgartown, Taft, 65; Wilson, 81; Roosevelt 58; Oak Bluffs, 41, 34, 64; Tisbury, 79, 36, 97; West Tisbury 26, 34, 21; Chilmark 21, 26, 20; Gay Head 20, 6, 1; Gosnold, 17, 4, 12. The Democratic candidate for president carried Edgartown for the first and only time since the Gazette was founded. The presidency was still in doubt when the Gazette went to press on Thursday Nov. 9, 1916, although, “it would seem from all information obtainable that President Wilson may be reelected. In the county Wilson gained 93 votes over 1912, and Hughes lost 26 from the combined Taft and Roosevelt votes for four years before.” The vote: Edgartown, Hughes, 138, Wilson, 82; Oak Bluffs, 103, 69; Tisbury, 111, 87; West Tisbury, 36, 36; Chilmark, 26, 30; Gay Head, 27, 5; Gosnold 23, 5. 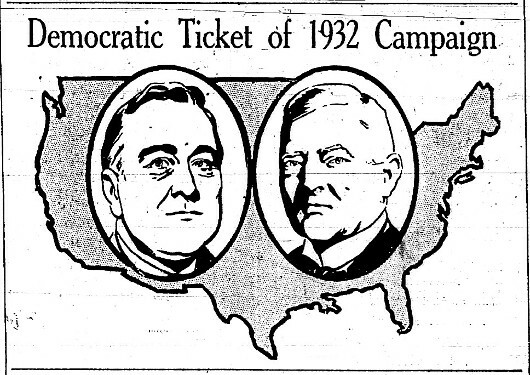 “Island Happy,” was the election headline in 1920, appearing over a cut of the enigmatic face of Calvin Coolidge, elected vice president on the ticket with Harding. In this, the first year of woman suffrage, Mrs. Henry H. Jernegan was the first Edgartown woman ever to cast a vote for the president of the United States. The vote: Edgartown, Harding 246, Cox 24; Vineyard Haven 298, 24; Oak Bluffs 242, 32; West Tisbury, 91, 21; Chilmark 61, 21; Gay Head 40, 1. In 1924, a year which saw Coolidge and Dawes elected with the largest popular majority in history, the Island voted: Vineyard Haven, Coolidge, 330, Davis 32, LaFollette, 28; Edgartown, 287, 28, 11; Oak Bluffs, 272, 25, 18; West Tisbury, 130 11, 3; Chilmark 71, 9, 9; Gay Head, 45, 1, 0. In the last presidential election, that of 1928, the largest voice ever cast on the Vineyard gave Hoover a majority of 987. Hoover polling 1443 to Smith’s 456. The vote: Chilmark, Hoover, 111, Smith, 14; Edgartown, 361, 91; West Tisbury 135, 25; Gay Head, 57, 12; Oak Bluffs, 324, 163; Tisbury 455, 121; Gosnold, 44, 11.